Galangal is sometimes confused with ginger, although the two are not the same. Known as khaa in Thailand, galangal tastes peppery and is often used in soups, stir-fries and curry paste recipes. Although dried galangal is sometimes available, the fresh kind is always the best to choose if you can get it. Galangal is lighter in colour and tighter formed than ginger and it often has pink bits on it. This root is in the ginger family and resembles a knobbly Jerusalem artichoke. It is found in South East Asian cuisine, especially Thailand, and is available in Asian grocery stores. There are 2 kinds of galangal. One originated in Indonesia and smells a bit like pine and tastes sharp. The other kind tastes peppery and gingery and more pungent. This type is thought to have originated in China. Galangal is added to food either in thin strips or crushed. You need to peel it and remove the top layer before adding it to a recipe because it is denser and harder than ginger. If you’re chopping it, make matchstick-thin strips. You can also grate it if you prefer. If you’re only using it to infuse flavour into a soup and you’re going to remove it afterwards, it is fine to cut it into discs without peeling it first. You need to cook galangal for quite a long time to make it tender because it’s so dense. A lot of Thai recipes blend galangal with garlic, chillies and shallots, creating a paste with these, which can be used to add flavor to meat or seafood curries. If you are using dry galangal, you need to soak it in hot water before use. Sometimes it is labeled ‘laos’ or ‘laos galangal powder’ and you can use 1 teaspoon of this powder to replace 1 or 1½ cm of fresh galangal. Powdered galangal is more convenient but it doesn’t offer the same fresh flavor. You can store fresh galangal for up to 2 weeks (keep it moist by wrapping it in greaseproof paper or Cling-film if you put it in the fridge so it doesn’t dry out because normal paper soaks up the moisture). The powdered kind keeps for months. Galangal juice can stain fingers and clothes, so take care when you are handling it. 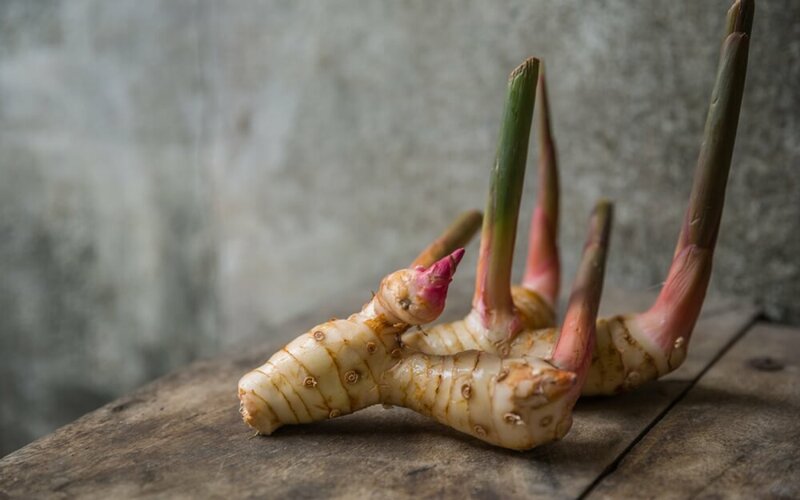 The spicy, fragrant, zingy and herbal note of this root adds wonderful depth of flavour to soups and curries, and if you’ve been to a restaurant and identified what looked like a piece of ginger in your curry or soup, it might well have been galangal. Whether you call it galangal, Siamese ginger, blue ginger, lao or laos, this ingredient is worth experimenting with. Its flavour is totally unique and it helps to lend authenticity to your Asian recipes.